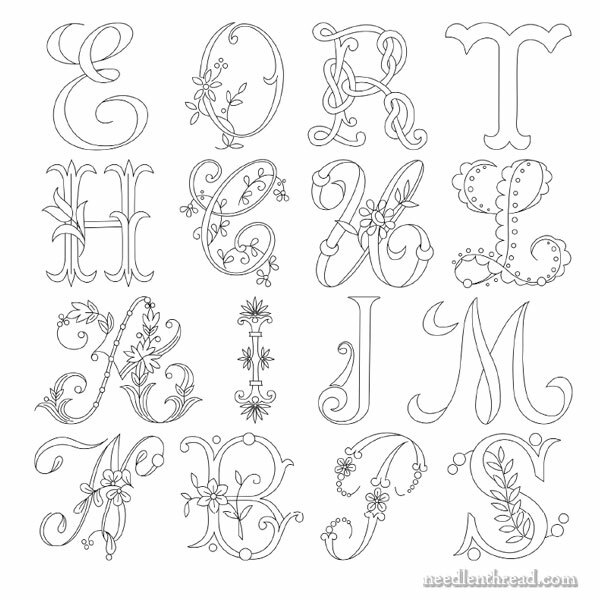 I mentioned earlier today in my post on the O and Q monograms that I was working on cleaner versions of these monogram patterns, thanks to Margaret’s tutorials she sent me on how to trace a design as a vector image. So here’s my first attempt! There are little points that are a bit more wobbly than I like, but overall the lines are smoother and clearer, and I think they will print a lot clearer on your printer! Anyway, what do you think? Do you like them better this way? I thought I’d poll readers to hear your impressions. What do you like better, since the patterns are here for you, after all! For the rest of the alphabet, please visit my Index of Monograms for Hand Embroidery! And let me know what you think about the different look of the letters! Thanks for giving these out! I love them! You you are right. The lines are much clearer. You have got a precious tool! Oooh, the R is gorgeous! Thank you! On screen, I like the sleeker feel of the R compared to some of the other letters but I think that the proof is in the pudding. In other words, it’s only after the letter has been printed out and it’s time to transfer onto fabric that you can really tell. Or so I imagine. By the way, I loved Melissa’s comment and Mary gets an A for her fabulous ‘R’ conversion! Wow! I don’t know what the deal is with vector but whatever it is, it works magic! That came out great! Thank you for this lovely R. I will embroider two pillowcases for a bride. Do you have any tips on the embroider technique that works best? Thank you. These are so lovely. Thank you again!! Your website is so very complete in so many ways…especially the details!! And we all know how important the details are! I love your site!!! So far, I’ve been able to find the answer or solution to every question I’ve had!! Such organization amazes me!!! Have a happy day! Jackie E.
I really appreciate the Flowered Monogram because it lets the letter dominate the work. That’s why I wanted a monogram. Your site is absolutely marvelous. I don’t know where to begin. I’m still new but what facinates me is the monograms. Excited to try my hand at it. Thanks so much for sharing your talent. Hi, Linda – Thanks for your question! As a beginner, you can approach embroidering the letter in a way that suits your level of stitching. You don’t have to make it complicated – you can use very simple stitches and still achieve a beautiful monogram. You’ll find tips for working different styles of monograms here: https://www.needlenthread.com/2016/09/embroidered-monograms-tips-techniques-index.html I don’t sell supplies, I’m afraid! But you can use regular embroidery floss (6-stranded DMC cotton, which should be available locally) for good results! I’m very impressed with the “R”. I’m into adult coloring and plan to use it as a notebook cover after it is colored. Thanks for your service.